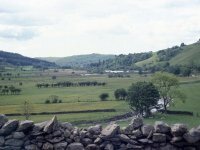 It's June 1989 and my walking companion Graham and I are undertaking a walk in an unfamiliar area, the fells around Kentmere in the far east of the Lake District. 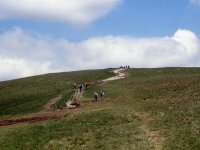 We're planning to do as much of the Kentmere Horseshoe as we feel able. This is a scene at the village of Kentmere. We're going to tackle the walk clockwise, starting with Yoke. 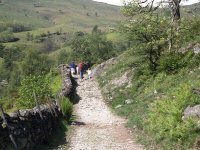 The approach takes us along this track, the Garburn Pass, a pedestrian route between Kentmere and Troutbeck. It's three miles from Kentmere to Yoke. 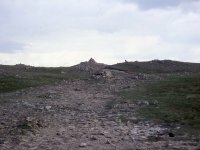 At the top of the pass (1475 ft) the route turns right along the ridge to ascend Yoke. Here, we're nearing the summit. The summit of Yoke, elevation 2309 ft. Yoke is just the first of several tops along the ridge and we were soon on our way to Ill Bell, the second. From the col between Yoke and Ill Bell we're looking down into the Kentmere valley. 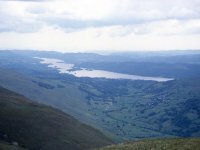 Ambleside and Windermere seen from the same point, to the south west. A reascent of 300 ft from the col brings us to Ill Bell, higher than Yoke at 2476 ft. Ill Bell is a shapely little pyramid of a fell and all approaches are quite steep. 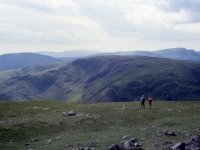 From Ill Bell we contiued further north along the ridge, heading for Froswick. 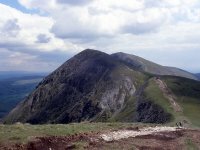 Froswick is a kilometre north of Ill Bell and is slightly lower, at 2359 ft. Like Ill Bell it is a shapely peak and the approaches along the ridge are steep. I can't be sure whether this is a picture of Froswick or a second shot of Ill Bell. 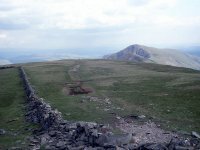 This picture is definately from Froswick and shows the view back along the way we've just come. 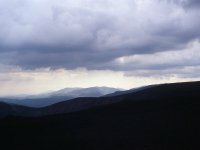 The profiles of Ill Bell and Yoke are well seen and from here the significant switchback nature of the ridge is obvious. 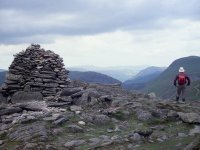 A further mile to the north along the same ridge brings us towards the tall, columnar cairn of Thornthwaite Crag. 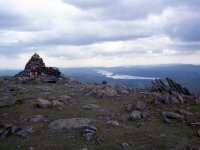 It's a significant top, at the junction of four ridges, 2569 ft high. 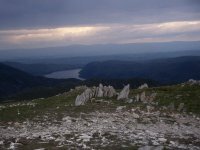 Looking back at Froswick from Thornthwaite Crag. Looking west, over towards the Scafells and Gable. 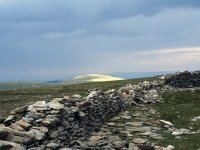 From Thornthwaite Crag the Kentmere Horseshoe curves around to the right to head for Mardale Ill Bell, but a diversion of a mile to the north will bring is to High Street, the highest fell of the Far Eastern group. It's just a matter of following the wall. Near the top of High Street, 2718 ft. 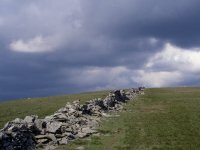 The fell gets its name from an old Roman road that ran along the ridge. 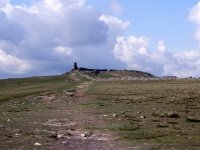 The fell is also known as Racecourse Hill, horse races having apparently been held on the broad grassy summit. 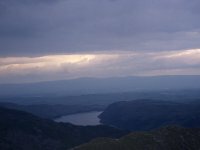 Way over to the northeast is Haweswater, with the profile of the Cross Fell group in the Pennines beyond. We're heading back to the southeast now for Mardale Ill Bell, not quite a mile away. Here's another shot of Haweswater. Here we're approaching the summit of Mardale Ill Bell, 2496 ft high and our sixth fell of the day. Looking over to the west we see that there's some adverse weather approaching. We could go on to "bag" the last two tops of the Horseshoe, Harter Fell and Kentmere Pike, but we think we've done the day justice. 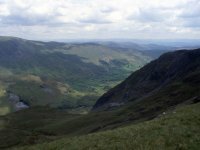 At the col between Mardela Ill Bell and Harter Fell we will find the track of Nan Bield Pass, which will take us back to Kentmere village and the car. 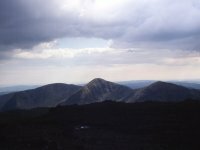 A final glance to the west, where Yoke, Froswick and Ill Bell are seen in profile and their neat pyramid-shaped tops can be appreciated.